One Eternal Day: "Give to the one who begs..."
Hold our money loosely. I think that’s what Lewis was getting at in the exchange with his friend. He was comparing the beggar’s suspected frivolity with his own known frivolity. 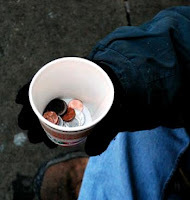 Only in the economy of self-justification is my spending $3 on a coffee or even a beer deemed more virtuous than, by presumption, a beggar’s doing the same. Trust him with people’s sins. Maybe that person will squander what you give them. It’s not our job to manage the expected sins of others. It’s our job to be faithful to God, obedient to his commands. So the better hedging of the bets here is to give out of obedience and trust the beggar’s financial management to the only God who judges the living and the dead. Let us give, and let us let the Lord sort it out. It will not bother me in the hour of death to reflect that I have been “had for a sucker” by any number of impostors; but it would be a torment to know that one had refused even one person in need.